Adapting Noel Coward's play Still Life, legendary filmmaker David Lean deftly explores the thrill, pain, and tenderness of illicit romance during the dour, gray Britain of 1945. From a chance meeting on a train platform, a middle-aged married doctor (Trevor Howard) and a suburban housewife (Celia Johnson) enter into a quietly passionate, ultimately doomed love affair set to a swirling Rachmaninoff score. Academy Awards: Nominated for Best Director, Best Actress-Celia Johnson, Best Screenplay, 1947. DVD: Standard 1.33:1; audio English Digital Mono; subtitles none; closed-captioned; single side - single layer; 20 chapters; rated NR; 86 min. ; $39.95; street date 6/27/00. Supplements: Audio Commentary by Film Historian Bruce Eder; Restoration Demonstration; Original Theatrical Trailer. Although I know much more about films than does the average person, my knowledge base lacks the depth I'd like, and most of my lapses come in the area of older pictures. DVD has been wonderful in this regard, especially since I started to do these reviews; however, I still remain woefully ignorant about much film history, although I'm getting there. 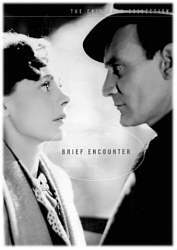 When I saw Criterion's release of Brief Encounter on the schedule, I decided to review it because the film was directed by David Lean. Frankly, I know more about Sizzlean than I do about David Lean, so I welcome the chance to witness additional examples of his work. Tragic admission: before BE, the only Lean film I ever watched was Lawrence of Arabia. Yes, it's pathetic, but it's true. Of course, the situation hasn't been helped by the fact that few Lean movies appear on DVD, and his most famous - including LOA, Doctor Zhivago and The Bridge On the River Kwai - are all MIA. One thing is certain: Brief Encounter shares little with those epics. In fact, the exceedingly small scope of the film makes it virtually a polar opposite of those later extravaganzas. Not that this is a bad thing, for "bigger" doesn't necessarily mean "better". That said, LOA is vastly superior to BE, and I'd be surprised if the others weren't as well. BE is a competently-made and mildly compelling film but it doesn't stand out as anything special. As I mentioned, the focus of BE remains very narrow, as it concentrates almost exclusively on a short but passionate extramarital relationship. By happenstance, housewife Laura (Celia Johnson) and doctor Alec (Trevor Howard) meet as they wait for trains, and from there they slowly embark upon their few weeks of love. Though the phrase didn't exist in 1946, BE is a prototypical "chick flick" and it most definitely will find greater favor among females. As for myself - and I'm most definitely all man, baby! - I could enjoy parts of the film, and I could respect the craftsmanship, but I never could develop any real interest in the storyline or the characters. BE was adapted from a Noel Coward short play called "Still Life". Apparently that production only lasted about half an hour, so the piece needed some extra material to stretch to a still short 86 minutes. Although there's little in BE that seems readily identifiable as "padding", I did feel that it appeared to drag for too long, and that's not a good thing in such a brief film. Brief Encounter isn't a bad film, and it has a few moments. Unfortunately, there were too few of these moments to help sustain my interest. Plain and simple, stories of this sort aren't my cup of tea, and it seems likely that fans of the "women's film" genre may get more out of it than I did. However, don't expect a whole lot from it, as the substance simply isn't there. Brief Encounter appears in its original theatrical aspect ratio of approximately 1.33:1 on this single-sided, single-layered DVD; due to those dimensions, the image has not been enhanced for 16X9 televisions. Although the picture shows its age, it nonetheless looks quite good for such an old movie. Sharpness generally appears nicely crisp and accurate, with only a few vaguely soft scenes to mar the presentation. I noticed no examples of moiré effects or jagged edges. Black levels seems nicely dark and rich, and although shadow detail occasionally seems a bit heavy and thick, it usually appears appropriately opaque without becoming excessively cloudy. The print itself is the most problematic aspect of this DVD, but even it seems relatively strong based on the advanced age of the movie. The image appears mildly grainy throughout the film, with only a few daylight scenes that demonstrate more intense grain. Occasional white or black speckles appear, but infrequently, and even more rare are other flaws like scratches or running vertical lines; those happen a few times but not many. The image sometimes betrayed a somewhat flickery quality that I found mildly distracting. I can't say that BE looks great, but it provides a picture I would call satisfactory. I felt about the same way in regard to the movie's monaural soundtrack. Dialogue seems pretty natural and clear; the accents interfere with intelligibility at times, but this doesn't appear due to the recording itself. Effects sound clean and acceptably realistic, and the music usually comes across as listenable and smooth, though louder passages can be a bit harsh. Some light background noise occurs throughout the film; it seems especially loud a few times - notably during some of the voice-overs - but stays pretty subdued for the most part. As with virtually all recordings of this era, the entire thing betrays a tone that seems thin and that lacks dynamic range. That said, BE sounds perfectly fine for a movie from 1946; it does nothing to stand out in a positive way, but it doesn't provide any significant flaws either. BE contains little in the way of supplemental features. Most compelling is an audio commentary from film historian Bruce Eder. As is often the case with this sort of track, his statements focus less on the film in question than they do on the history of the period, the genre and the participants. Eder does provide a fair amount of insight into BE, but he spends more of his time informing us of details in the categories I already mentioned. It's a good piece overall, and Eder relates brief but helpful facts about those areas. Since I knew little about any of them, the information helped me appreciate the film a bit better, though I still didn't really care for it. After that, we only find the film's theatrical trailer and a short demonstration of the improvements made during the movie's restoration. Ironically, the restoration itself doesn't make the changes all that clear, but when we watch the trailer, we see exactly how bad the film could have looked and sounded; it's fairly atrocious in both regards. Brief Encounter provides an early look at the career of David Lean, although one won't find any of the scope or grandeur of his later films here. Instead, BE remains a very small character piece that was too mushy and sentimental for my liking. The DVD provides adequate picture and sound plus a pretty good audio commentary. Brief Encounter may deserve a look as something of a historical footnote, but I can't recommend the film on its own merits unless you're a big fan of the genre.